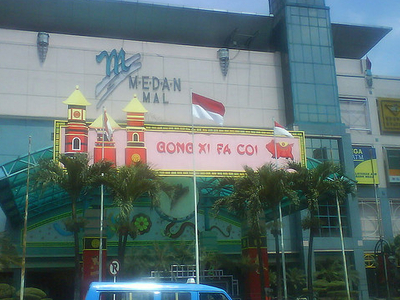 Medan Mall is one of the shopping center which is located in the city of Medan , Indonesia . The size is quite large and surrounded by a large market called Central Market . This shopping center , among others, is occupied by the Sun Macan Yaohan Department Store and Supermarket . Medan Mall visitors often congested because of its location close to the market. Just east of the mall there is also an Olympian Plaza that has long existed long before the Medan Mall was built . In the West and North West artifacts Uniland Building and Big City Field Station (about 500m ) . The streets around the mall is one of the congestion zone . Congestion usually occurs on roads Sutomo , MT Haryono , Thamrin , especially during school hours coupled with the Market Center affiliated with Sambu Terminal Market Center . Here's the our members favorite photos of "Malls in Medan". Upload your photo of Medan Mall!